Pianist Kathleen Supové was our very first visiting artist and thrilled the Sainer audience, starting off with Daniel Bernard Roumain's Jam!, a high-energy blending of several discreet styles. 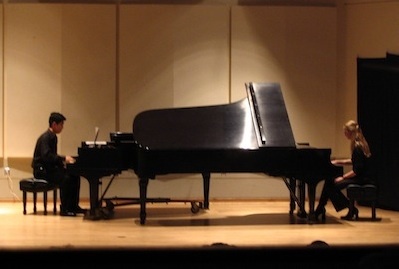 Using extended techniques and playing percussion instruments as well as the piano, Supové then performed Orlando Jacinto Garcia's Why References?, and followed with Carolyn Yarnell's moving The Same Sky, for piano and electronic playback. Randall Woolf's Sutra Sutra involved Supové reciting and singing in addition to playing. The concert concluded with the raucous and demanding Winnsboro Cotton Mill Blues by Frederic Rzewski, and the audience leapt to their feet with applause. Twenty-one New College students worked with Professor Stephen Miles for six weeks, exploring social aspects of music through Miles's collection of experimental compositions, Social Studies. Each composition is a sonic game that uses a specific social dynamic—resistance, negotiation, affiliation—as its generative principle. Three of the pieces, along with contributions by student Audrey Troutt and NMNC Producer R. L. Silver, were performed in the ground floor rooms of College Hall, with audience members dispersed throughout the space, and sometimes joining in the performance. In addition to Miles and Silver the performers were New College students Christine Difato, Michael Ferguson, Whitney Fisk, Emily Hendrick, Raea Hicks, Chantal Johnson, Megan Jordan, Andrew Kay, A. Page Laubheimer, Jeff Lundy, Tara Nixon, Thomas Patteson, Emily Payne, Christine Savage, Steve Scott, Michelle Steele, Mary Beth Swartz, Audrey Troutt, Justin Vickers, Evan Williams, and Sara Wood. As a warm-up to our upcoming February concert (see below), a group of students, faculty, and staff workshopped Cardew's The Great Learning, Paragraph 7 in the vaulted space of New College's Isermann Gallery. 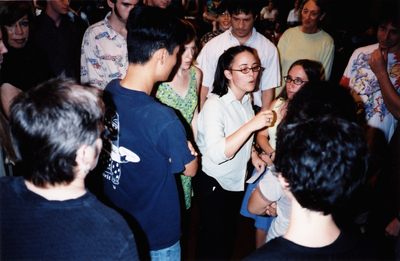 More than thirty New College students, faculty, and staff, as well as members of the community performed Cornelius Cardew's great experimental work based on text from Confucius (Cardew composed different types of pieces for each of the paragraphs; Paragraph 7 is for voices) in the College Hall Music Room. Comprised of twenty-five short lines (most are only one work, two are simply hummed), the piece directs each performer to choose a starting pitch and sing each line a specific number of times, each for the length of that performer's breath. Before moving on to the next line, the performer moves around the space and chooses another pitch being sung by a different performer. And so the piece progresses, forming clouds of pitches and unexpected consonances. This was the first of many times NMNC would present this fascinating piece. The performers were Taylor Briggs, Eliot Chayt, Maribeth Clark, Brian Claes, Don Colladay, Sebastian Codas, David Cotter, Christine Difato, Mike Ferguson, Whitney Fisk, Konnie Kruczek, A. Page Laubheimer, Paul Lewis, Jeff Lundy, Stephen Miles, Tara Nixon, Heather Normandale, Thomas Patteson, Emily Payne, Lea Rosen, Steve Scott, David Singh, R. L. Silver, Margaret Stanny, Mary Beth Swartz, Audrey Troutt, Justin Vickers, Amber Vistein, Jerry Wheeler, Evan Williams, and Sara Wood. Experimental music was the focus of this concert, beginning with three realizations by New College students Audrey Troutt, Emily Payne, and Michael Ferguson of sections of Cornelius Cardew's graphic score Treatise. Then New College alum Jeff Morton's Five-Plus, with a score comprised of prose instead of traditional notation, was performed by the brass quintet The Quinfonians. The second half of the concert was Hocket Science, a piece devised by students Taylor Briggs, Eliot Chayt, A. Page Laubheimer, Thomas Patteson, Steve Scott, and Audrey Troutt under Stephen Miles's direction and performed by a group of sixteen vocalists. Eight began in the Music Room and eight in the Sun Room; each octad began singing "a song from childhood," then divided the melody so each member sang only a part (a "hocket"). Pairs from each group met in the Great Room, where each pair negotiated which parts of their individual hockets to keep, and which to jettison. 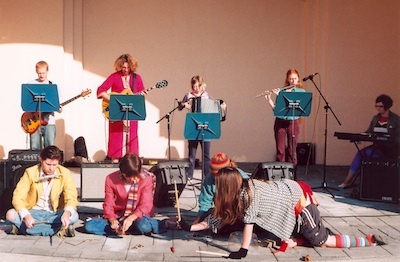 Then the octads reformed, with the new material forming the basis for their melodies. New College students explored the intersection—and contradictions—of Minimalism and Experimentalism in this wide-ranging concert, beginning with Tara Nixon's interpretation of John Cage's The Year Begins to Be Ripe. Cage's Living Room Music was performed by Samuel Arthurs, Taylor Briggs, Michael Ferguson, and Emily Payne; then Nixon returned for his 36 Mesostics re and not re Marcel Duchamp. George Brecht's Comb Music was next, first performed by Arthurs, Briggs, Nixon, and Matthew Hettich, then by the entire audience. The first half of the concert concluded with two pieces by Steve Reich: Pendulum Music performed by Arthurs, Briggs, Nixon, and Hettich, and Piano Phase performed by Payne and Ferguson. The audience then went outdoors to the PepsiCo Arcade behind the auditorium to witness Briggs, Sallie Scribner, Evan Williams, Alia Schwartz, and Katie Jones performing Frederic Rzewski's Les Moutons de Panurge, with other students joining in on percussion.